I have a confession to make. Well, it’s not really a confession. I should say I’m announcing on a public forum that I hate pumpkin pie. I know. It’s un-American of me. I just think that pumpkin pie is unnecessarily squishy, and often isn’t even made with actual pumpkin. Traditional Thanksgiving desserts tend to be each of these pies, plus maybe a pecan one and some vanilla ice cream, cool whip, Reddi-Wip—you get it, some sort of fluffy white topping. But I’ve taken it upon myself to show you a whole new world of Thanksgiving desserts that can complement the pies you probably made already. One of the things I love most about Thanksgiving is the way every family celebrates differently and makes their traditions unique. Some people just have their nuclear family of four sit down at the table with only traditional foods. Others, like me, have various families that all do different things, which often results in a 30 person feast stuffed into a house, complete with odd sides like coleslaw and ambrosia salad. I attend both my own family’s Thanksgiving and my best friend’s, because her grandmother has essentially adopted me. Between the two, I have taken on the task of trying every dessert available. Some of the recipes are of the storied-family-secret type: the only record of them is on a tiny handwritten index card shoved in a box in the back of a cabinet. Mostly, they live in the memories of the people who make them. But I traipsed the internet for similar recipes with more concrete instructions that you can follow on your own. I have to say, the list is heavily biased towards cookies. What can I say? I’m a cookie girl. My best friend’s grandmother, Mimmie, is a wizard of cookies. She spends the weeks leading up to Thanksgiving baking like crazy, and freezing the batches to prepare. On the day of, hundreds of cookies defrost on plates for after dinner. It’s simultaneously impressive and terrifying. Some are experimental, and never return in the following years. Others, like the ones here, are constants. Some of the recipes are more work than others, but baking is an art. It’s worth the time, I promise. Raspberry thumbprints are those cookies that you always saw at your grandmother’s house but never tried because you were afraid. Don’t be. The buttery cookies go so well with the tart raspberry jam, and as a whole they’re a nice contrast to some of the heavier, more noticeably sweet Thanksgiving desserts. Feel free to leave out or replace the almond extract if nuts aren’t for you! An American classic. If you’ve been to a bake sale, odds are you’ve had peanut butter kisses. Peanut butter and chocolate is a classic combination for a reason, and all the PTA moms know it. The slightly crispy peanut butter cookies pair perfectly with the Hershey’s Kiss on top, and they look really cute all together on a plate. I highly doubt the cultural accuracy of this name. One of my favorite cookies at every one of my adopted family’s holiday dinners has many names. 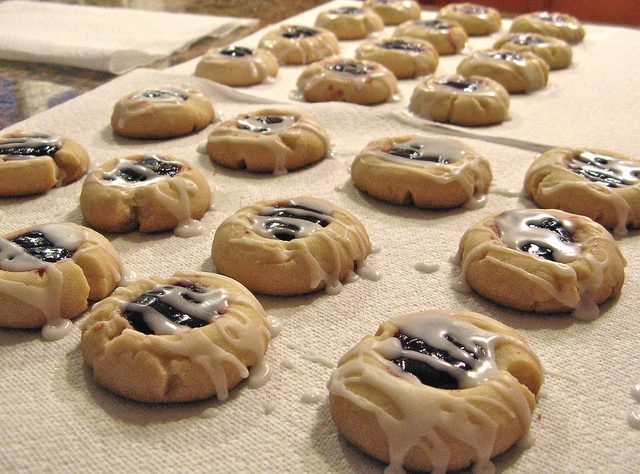 They call them pecan sandies, my mom calls them Mexican Wedding cookies, and others call them Russian teacakes. No matter what you call them, they are a delicious, powdered sugar covered shortbread cookie. They’re so messy and fun, and best of all, very easy to make. Cranberry white chocolate blondies are the dessert you never knew you needed. Cranberries are the epitome of holiday fruits, and they balance out the blondie and white chocolate, which can often be almost too sweet. They’re really colorful and pretty, and don’t take a lot of work. If you like nuts, check out these — or if you don’t, or have an allergy, this recipe is for you (the cinnamon whipped cream sounds amazing)! This cranberry cake looks like something you would buy in an upscale bakery way out of your price range. It’s an impressive, towering work of art that uses that same favorite holiday fruit in a different way. The layers of the cake are separated by a cranberry filling, the entire thing is covered with whipped cream frosting, and then it’s topped with sugared cranberries. It’s really decadent, but with that right mix of flavors you can eat more than you think. In making this list, I gently remind you: holidays for the college student are about seeing family and eating as much as you possibly can. Let your inhibitions and inner health conscious voice leave you. Just eat the cookies you are given and be thankful.